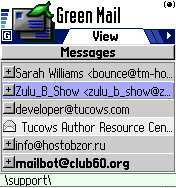 GreenMail - Supported messages types: SMS, EMail (SMTP, POP3, IMAP4 ), Fax, MMS, IrDaDocument, BlueToothDocument, Intellect SMS. 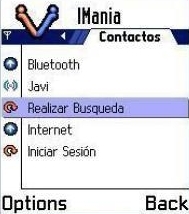 The Symbian smart phones already have program for messaging - "Messages". Primary difference between GreenMail and Messages: GreenMail: Can group your messages by addressee. Has SMS chat, while checking new mails it can, download not only your mail's headers but all mail's body in accordance by mail size limit. Can copy and move your messages whenever and wherever you want . (Except your mailboxes). Can create your folders in any places. (Except your mailboxes). Can show date and time your messages were added into the subject line. Can decode your message for some no standard codes. Has More feature for mail server synchronization. Can type on additional languages into the SMS chat. 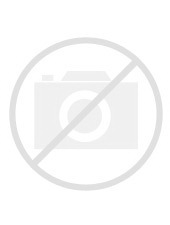 Check automatically new mails by timer.